Here it is! 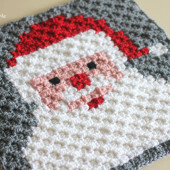 The last square in the Crochet Christmas Character Afghan!! The Christmas Stocking (complete with presents sticking out of the top), is another iconic image that couldn’t be left out of the blanket. 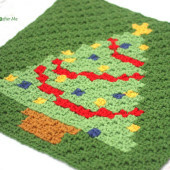 But check back in the next couple days for a bonus square and links to some other Christmas pixel square ideas if you want to continue the blanket or replace one or two of your current squares you may not be happy with. I will also be posting directions on how to finish the blanket including adding a few embellishments, joining the squares, and adding a border! If you are just joining in, you can find the links to the other 8 squares below! Each pixel graph in my blanket is 25×25 pixel squares. I used a size F (3.75mm) hook and worsted weight yarn. For this particular square I used Lion Brand Vanna’s Choice in Silver Gray (for the background), Scarlet Red (for the sock), White (for top of sock) Fern Green and Mustard Yellow (for holly Berry), Colonial Blue and Little Boy Blue (for the blue present), and Pink and Cranberry (for the pink present). For each of these squares you will need about two skeins of the background color and possibly two of any color that makes up the main image (like white for Santa). Otherwise you will need only one skein of the other colors. CLICK HERE to download the Christmas Stocking Graph! Several crocheters and generous followers of RCM have been taking these pixel graphs and writing out the color changes as they make their squares. I will add the written pattern for these color changes as they are shared with me! 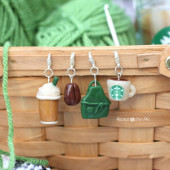 Written pattern for the color changes by fellow crocheter and RCM follower, Claudia Melgar! Thanks Claudia! Love these squares. 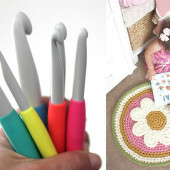 You do great crocheting! Do you think that you could come up with a single list that has all the yarn colors listed with name of color and the total ounces of each color used for the entire 9 squares so I can purchase the amount at once.? (due to colors may change slightly over time. ) Save me some time also. I just love your design sense. I especially love this afghan with decorative squares. I have never done C2C or a crocheted image, but I am about to learn how and create at least some of these adorable images for my great grandchildren for Christmas. Thanks so much Sarah. Thanks so much for sharing your wonderful patterns. I had never tried c2c graphs but have enjoyed the challenge. I can’t wait to see the finished product. Thank you so very much. I hope to get all I need to get this done for next year. I think you did a wonderful job these are very beautiful. Did you ever think about doing any more like an angel , manger, shepherd or wise men? I believe that Christ is the reason for the Christmas season. Just an idea. Thanks! Hi Sarah, this is such a lovely idea. The squares are christmassy , the c2c technique is addictive and it all mounts into an afghan. What more can you wish? How are you changing colors? Are you using slip knot to join new color when needed. Wow, it looks great! Lovely! I’m nearly done with the last panel, how do you generally join these? I have enjoyed your site so much and want to thank you for your patterns, they are amazing! I just love your work……it is beautiful!